Lincrusta are one of the most trusted names in home decor and design. The company has been in operation for over 100 years, and have made their name by supplying wallpaper and wall decor to royal residences and even the White House. While Lincrusta may be most associated with deeply-embossed wallpaper, the company also produce a number of other wall decorations. We’re going to focus on two of their options; Lincrusta friezes and borders. 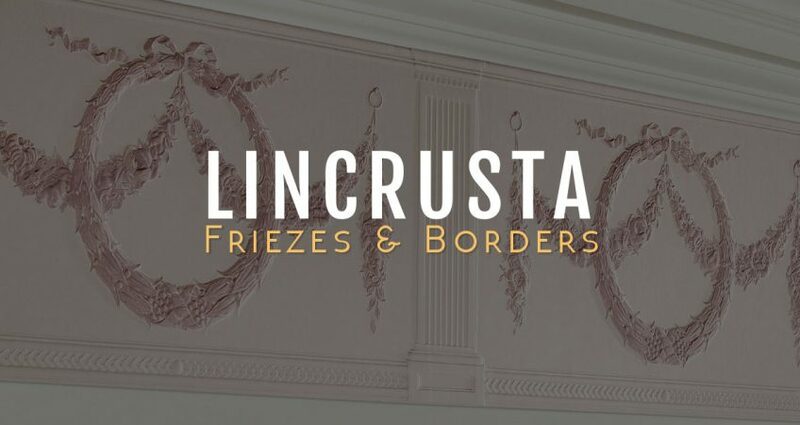 What are Lincrusta Friezes and Borders? Lincrusta Friezes: To put it simply, friezes are a horizontal band of decoration. Friezes can be sculptured, with the design engraved into stonework, or a band of paper. Friezes are most frequently placed at the top of a wall, helping to give height to the room. Lincrusta borders: The can be used to create picture rails, panels, and dado rails. They are adhered to the wall and offer excellent feature points. 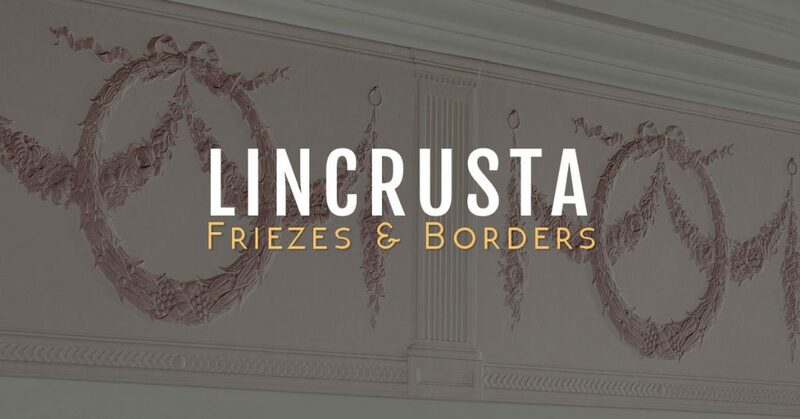 Lincrusta offer seven different friezes, so let’s dive right on into the offerings available from this world-famous company. The Adam is a beautifully designed frieze, complete with Lincrusta’s classic style. The design features Grecian urns, which are linked together by leaf garlands. The urns and garlands appear to protrude slightly from the wall when applied. You can customise the Adam by painting it to match your colour scheme. This beautiful design has been popular since the 19th century, and it’s easy to see why. With a style resembling that of Ancient Roman decor, the Adelphi features Roman columns, laurel leaves, and floral decorations to create an opulent finish. The Anne is a more complex option than the first two, featuring a “full” design that comprises of garlands, floral decorations, and winged creatures. The design appears to protrude from the wall and is fully paintable. The Cameo frieze offers another chance for time travel, this time back to Regency England, a time popularised by Jane Austen’s Pride & Prejudice. The Cameo features a design of small cameos, which are linked by floral bands and intricate decorative sashes. ● The Cameo rolls are 28cm x 10m. The Diana is an altogether more modern option, featuring a simple but effective swirl design along with touches of floral decoration. The design is more recessed in appearance than other choices, and can be painted to emphasise this beautiful quality. ● The Diana rolls are 28.2 x 10m. The Empire is incredibly rich in detail. Peer closer to discover a riot of flowers, garlands, decorative swirls, and even a touch of geometrical shaping along the border. The design appears to protrude from the wall, demanding attention in an effortlessly stylish manner. ● The Empire rolls are 27.7cm x 10m. This frieze is something different again, predominantly featuring garlands of flowers to evoke 19th century decor trends. The design protrudes from the wall, and has a luxurious-yet-simple attraction that would enhance any room. ● The Francesca rolls are 28.2cm x 10m. This border is very softly sculpted, appearing rounded and gentle. Due to this design feature, it makes for an excellent dado rail that can withstand any movement. Rolls are 1.3” wide x 10m in length. This border is more structured, offering clean cut lines that could help to enhance a more modern aesthetic. It is incredibly versatile, but looks particularly effective when used to create wall panels. Rolls are 2.8” wide x 10m in length. Finally, this border is best described as a combination of the two options above. It is more rigid than the soft lines of the first, but not quite so structured as the second. It is therefore a perfect choice if you are stuck when trying to choose between the first two! Rolls are 1.6” x 10m in length. If you have fallen in love with the delicate designs of Lincrusta borders and friezes, Lincrusta patterns or dado panels, get in touch to arrange an installation.